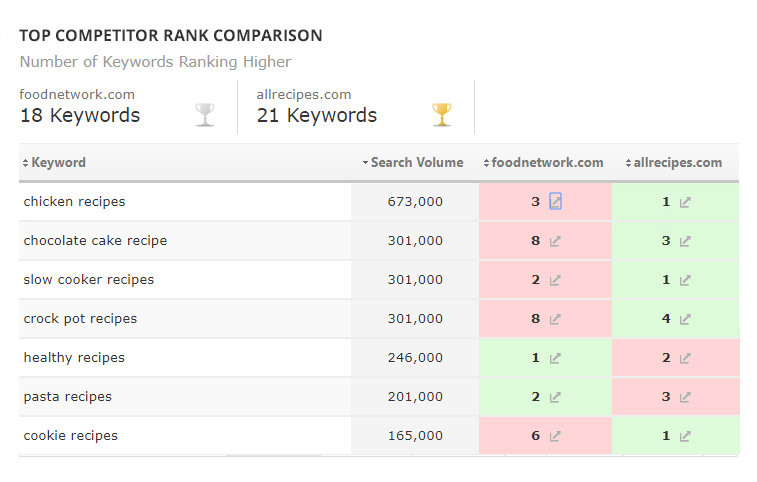 See all the competitors ranking in the top 20 Google results for your keywords. Track who’s ranking for the most keywords, who has the top overall visibility score, and how much total search volume is at stake. 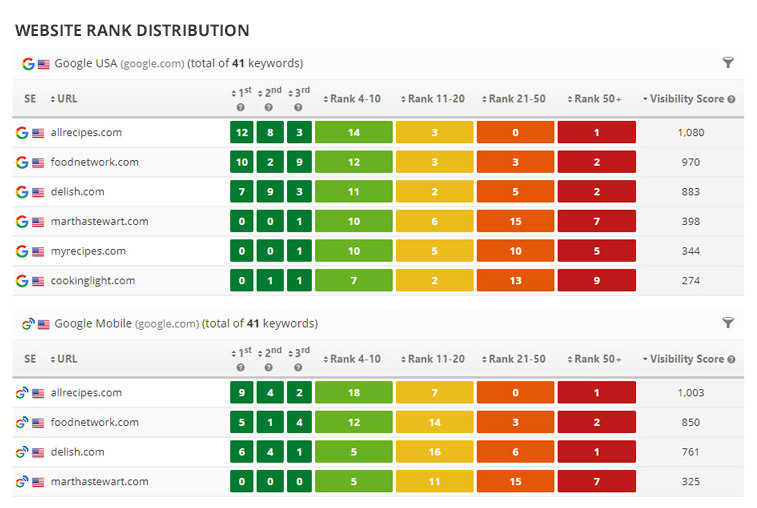 Drill down into each competitor to survey their rank as compared to your own across all your keywords. Easily access their highly ranked landing pages and analyze them so you can improve your UX and rank. Get an inside look into your competition’s attempts to increase their CTR. View all the changes they made to their page titles and descriptions over the past 30 days. 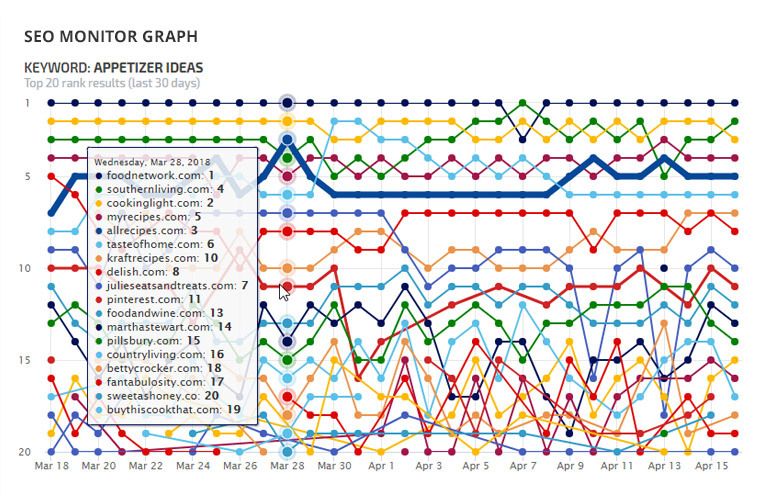 Keep tabs on the competitions' daily rank changes as well as their SERP feature gains and loses. The ultimate competitor research tool which gives you valuable information about any website: which keywords it is ranking for and the landing page for each, keyword difficulty scores, estimated traffic the website is receiving per keyword, available SERP features and more. Take a look under hood of your competitor’s website using our Organic Pages Report. You get access to a comprehensive list of the pages on your competitors’ websites that are ranking organically. Analyze the competition’s landing pages that are ranking organically so you can build 10x content that will out rank them. This information is a veritable goldmine for your SEO and content creation teams. 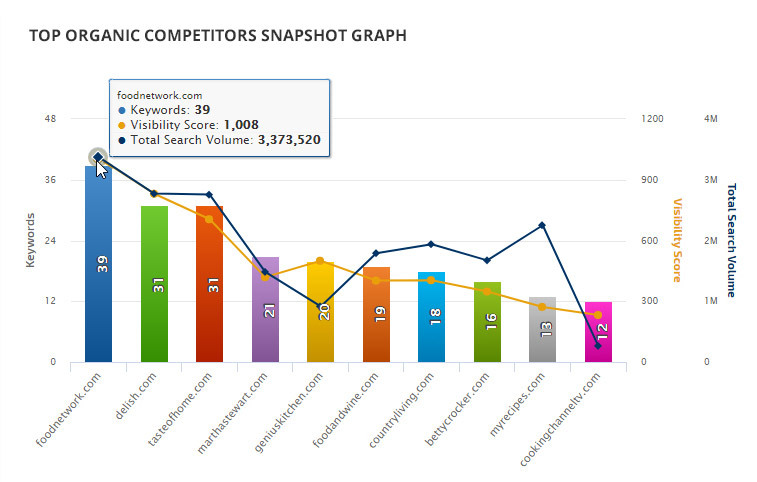 Find out who the top organic competitors of any website are and how many organic keywords does each competitor rank for. Discover how many of the keywords the websites have in common and how many are unique. Get an inside look at the Google Ads being run by any website with the Paid Keywords report. Review the keywords they are targeting, analyze their ad copy and examine their PPC landing pages. 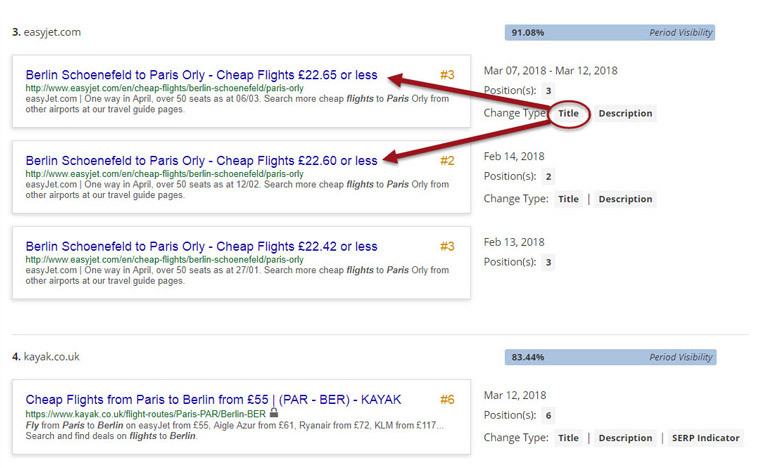 Wouldn’t you want to analyze your competitors’ PPC landing pages to get some insights for your own? Well that’s exactly what you get with our Paid Pages report. In addition, you get access to other valuable metrics such as the page’s rank, the number of keywords the page ranks for organically, the top organic keyword etc. Discover who are the top advertisers competing with any website on Google Ads. View the total number of keywords they’re running ads for. See how many of those keywords are common to the domain you searched for and its competition and compare that with the PPC keywords that are unique to each site. The Ad Viewer report lets you generate a comprehensive report of the ads any website is running on Google Ads. Check out their ad copy and formulate your own ideas. Many clients are interested in seeing how they rank in comparison to their competitors. That’s why we created the Competitor Rank Comparison report that conveniently shows your website’s rank and that of your competitors side by side for all of your keywords. The report can be sorted, filtered, fully customized, and is easily added to any of our white label reports. Any comprehensive SEO competitor analysis must include a view of the overall rank distribution of your website versus the competition. 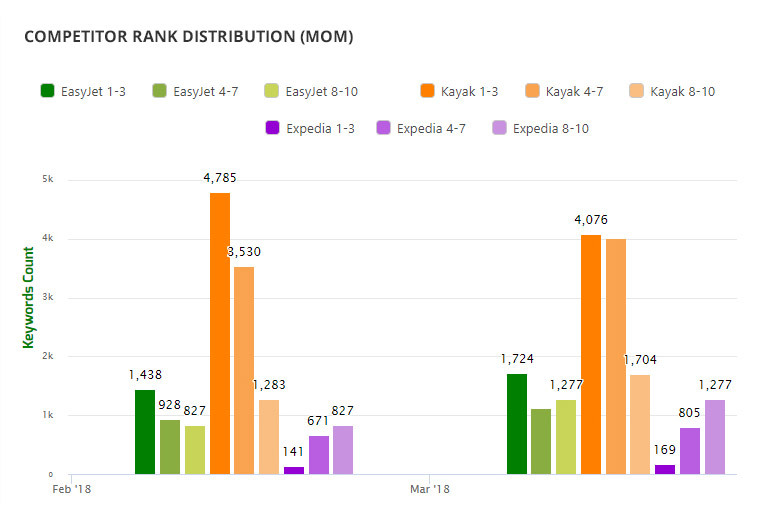 The Website Rank Distribution report shows you how your and competitors’ keyword rankings are distributed across the various positions on the SERP. Utilize the many report options to customize your data and include it in a white label PDF report, client dashboard, or Marketing Dashboard. Of course you’ll be able to use our versatile Insight Graph to chart any available rank and third-party metrics to visualize your performance versus your competitors.